Week 16 was supposed to be the last week of our summer CSA. We were told that since it was such a good growing year we would get a bonus week 17. However for week 16 we got a giant butternut squash, an acorn squash, a carnival squash, several different peppers, tomatoes, celery, celeriac, sweet potatoes, kale, and apples. At least that is what I remember. My dad said there was also napa cabbage and a giant cauliflower which he put in the take it or leave it box. I did a few unimaginative things this week with stuff such as finally making vegetable broth with all the scraps that have been collecting in my freezer all summer. 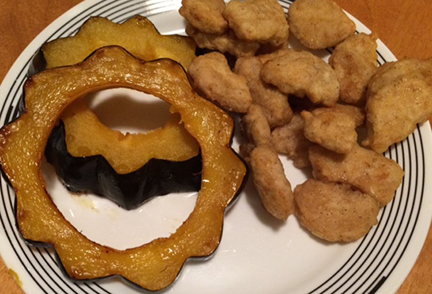 I also just roasted the acorn squash and we ate it just like that with some Wegman’s “chicken” nuggets. 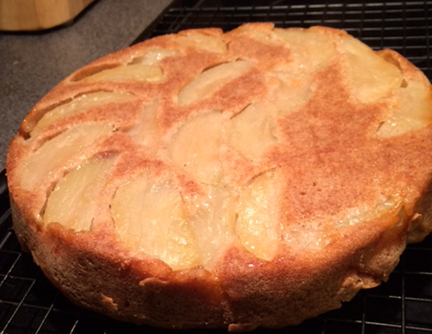 We had apples from our CSA and also apples from our apple picking adventure at Berlin Orchards so I made an Italian Apple Cake. The recipe is from Chloe’s Vegan Italian Kitchen. Then finally Monday on Columbus Day I actually made something interesting. 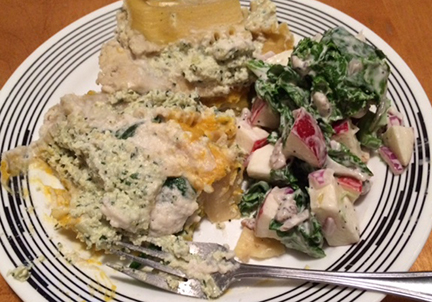 I made the White Lasagna with Roasted Butternut Squash and Spinach from Chloe’s Vegan Italian Kitchen. I used part of the ginormous butternut squash from our CSA. With it I used the lettuce, celery, and more apples from our CSA to make a Waldorf Salad. 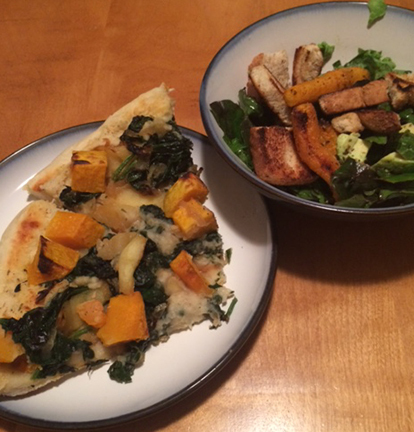 To cap off the week we used more of our roasted butternut squash and i made the butternut squash, apple, and onion pizza from Chloe’s Vegan Italian Kitchen. i used apples from our apple picking trip and the squash from our CSA. To go with it I made the roasted carrot and avocado salad from the same book. I used the carrots I got from the farm stand and lettuce and kale from the CSA. My guinea pigs also helped us use up some of our CSA. 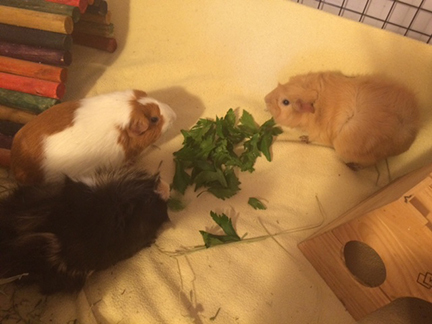 I gave them some of the really nice celery leaves from our celery and they were quite happy about that! For week 15 and what was to be the 2nd to last week we were still getting a huge amount of food. 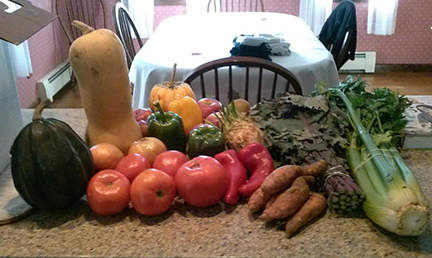 We got potatoes, green peppers, red peppers, tomatoes, pears, apples, the biggest cabbage I have ever seen, a ginormous head of cauliflower, a huge butternut squash, a small delicata squash, a red onion, a white onion, and my dad got me some carrots and eggplant at the farm stand that I needed. 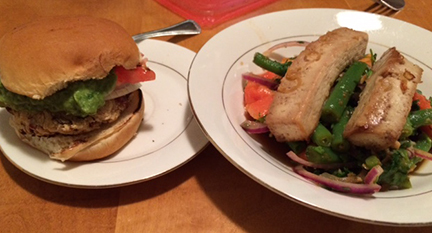 I made a recipe called Pizza Burgers from Chloe’s Vegan Italian Kitchen which really didn’t have anything from the CSA in it other than a slice of onion and a slice of tomato on top. But the salad I made with it was a papaya and green bean salad with lemongrass tofu. 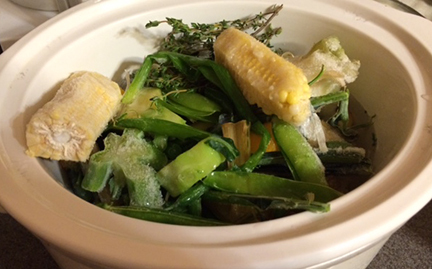 The green beans and red onion in it was from our CSA. I adapted a recipe from Salad Samurai to go with what I had. It was supposed to be a green papaya but by the time I got around to making the salad the papaya was ripe. 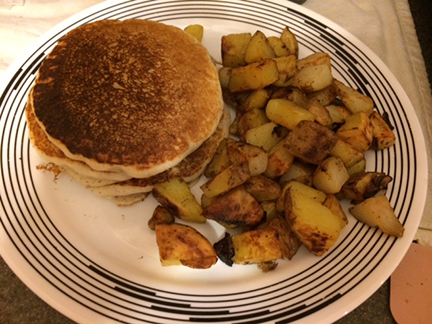 This week (Monday) was my birthday so Sunday morning my husband used up all our potatoes and made home fries for breakfast for me and also some pancakes. Was a really nice surprise and yummy too! 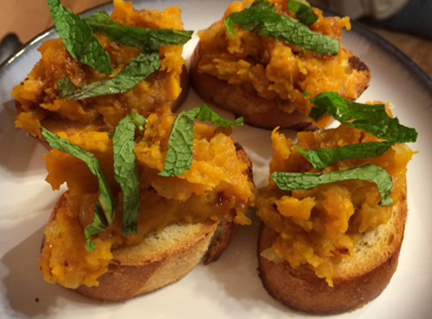 To use up a bunch of our produce I made the Dilly Stew from Isa Does It again which used up potatoes, carrots, and onions from our CSA and i tried a new recipe from Chloe’s Vegan Italian Kitchen and made the butternut bruschetta with some of our butternut squash. The bruschetta was sooooooo soooooo yummy. It wasn’t really a practical recipe for two people even when cutting the recipe in half but it was really yummy. I had my dad get me two medium sized eggplants from the farm stand when he picked up our box so I could make the minted eggplant pasta from Chloe’s Vegan Italian Kitchen. The overwhelming flavor of the pasta was sun dried tomato but I think maybe the eggplants were on the small size. To go with it we took out an old recipe for cauliflower we hadn’t done in a long time. I don’t even remember where the recipe is from but it’s caramelized onions, cauliflower, and poppy seeds. I took what I thought was a green cauliflower and tasted it and it tasted odd. 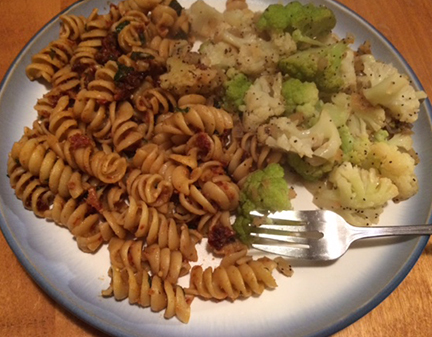 After some internet sleuthing I decided it was broccoflower but I still used it like it was cauliflower in this dish. To use up a lot of our CSA vegs I made a stiry fry and a kale salad with roasted butternut squash. The stir fry used up several CSA peppers and the rest of our cauliflower and broccoflower. The roasted butternut squash in the kale salad was from our CSA. We have one week left of CSA vegs! Monday morning we woke up early and said goodbye to Sadrah and Mike and drove the 2.5 hours back to the Charlotte airport. This time we made sure to leave ourselves pleeennnnntttyyyyy of time to get there. We got there with 2 hours to spare instead of 1 minute. I wondered around the gift shops at the airport looking for a toddler sized Charlotte tshirt for Charlotte and sadly could not find one. Then we got on the plane and headed back to Boston where we had to find where we dumped our car in our haste and see what the damage was for parking in central parking vs economy parking (hint: double the price). Sunday was our last day in NC. Seth, Rebecca, and Sage had spent the night and we were all going to the Biltmore for the day. Mike could get us in for free since he works there which was great because it’s REALLY expensive to go there. Before heading out we were going to have a cousin photoshoot. Sadrah is also a professional photographer and was going to take pics of the two girls together. When we came upstairs for the morning I saw Sage was wearing some Osh Gosh overalls and I had just happened to have packed Charlotte’s Osh Gosh overalls so I ran downstairs and put them on her. For the photoshoot Sadrah also put on overalls to be all cute and match matchy. I tried to stay inside for the photoshoot cause I know Charlotte does better around others when barnacling to mama is not an option. I waited awhile then peaked outside and asked if I could come out. Josh said no and then I said “ok Im going back in” and apparently that is when Charlotte heard me and the photoshoot was pretty much over if it had begun at all. After the photoshoot we all got ready and headed out to the Biltmore. The Biltmore is really cool. I didn’t even know it existed before I heard Mike worked there and then I just knew it was a fancy hotel I didn’t really know anything about it until we planned our trip and I looked it up online and saw it was a GIANT CASTLE. It’s basically the American Versailles. I still don’t know tons about it. Usually when we go places I like to read about the history of where we are going or specific locations but my little friend Toodles doesn’t allow much for that anymore. And when we were there it was hard to learn about it with toddler in tow. Sadrah and Mike came with us to the Biltmore estate but left us at the house in favor of going hiking on the grounds so me, Josh, Charlotte, Rebecca, Seth, and Sage went into the house and tried to do the self guided tour. We did as best we could with 2 toddlers in tow. Sage was super bored with the whole experience and Charlotte was ok for about 3/4 of the tour then started to get squirmy. Both girls were getting tired but at the same time wanted to run around on the big lawn. The great dichotomy of toddler life. What we were able to take in was pretty cool. The place is crazy enormous and ornate. Historically all I got out of it was it was built by the Vanderbilts and eventually turned into basically a museum. For some reason you aren’t allowed to take any photographs inside. I took a few pics with my cell phone until I got yelled at. After we finished with the house we took about 5 minutes to look at the walled garden and realized we would need an entire day to even make a dent in viewing the gardens so we went and looked at a fish pond with the girls then we all headed back to meet Sadrah and Mike in the parking lot and went to lunch. We went to Wicked Weed Brewing again, this time to eat. When we got there both girls were asleep after their big morning. Sage is obviously a much better sleeper than Charlotte (doesn’t take much) and was just passed out on the bench at our table. Charlotte I strapped to the front of me in the ergo and tried not to move. It made for some difficult eating but it extended her nap for quite awhile. Both girls woke up at various times during our meal and after we were done eating it was time to say goodbye to Seth, Rebecca, and Sage who were headed back home. We had to get back to Sadrah & Mike’s house to attempt to actually pack up all our junk that was spewed everywhere for our flight home the next morning. Saturdays Mike and Sadrah spend their morning at the North Asheville Tailgate Market selling their seitan so they were already there when we woke up. We met them there later and wandered around looking at all the various things for sale. There was even a lady selling vegan baked goods. They were gluten-free vegan baked goods which is not really what Im into since I don’t really like the taste of gluten free baked goods but they were vegan so yay for that. I got a muffin and it was quite good. We were on the hunt for coffee and we did find some but inexplicably no one had any almond or soy milk. And I thought this was a hippie market. Charlotte thought the market was great because she basically just tore around toddling here and there. I tried to navigate her so she wouldn’t mow people down but mainly I just let her go. We were going to be going to a beer and music festival later so I needed her to nap beforehand for it to be at all successful so I need her to wear herself out. After the market we stopped at a botanical gardens at the entrance of UNC Asheville which is where the tail gate market was held. We let her toddle around there for awhile too. When she seemed good and toddled out we headed back to Sadrah and Mike’s house to see if we could get her to nap. I kept her awake in the car as the whole point was for her to sleep in the bed so I could get stuff done while she was napping and get ready for Brewgrass which was the festival we were going to. She *really* wanted to fall asleep in the car but I managed to keep her awake. Once back at the house in true form she completely refused to nap. This is pretty much how she operates. At my wit’s end we finally put her back in the car and drove around Sadrah and Mike’s neighborhood. She fell asleep and when we got back to the house I sat in the car while she slept. That is called being “nap trapped.” We let her sleep and eventually left again with her still asleep and made our way to Brewgrass which was being held at a baseball stadium. It’s basically exactly what it sounds like. It was a beer festival with various local breweries handing out samples and brew grass musicians playing. I bought a designated driver ticket since a full price ticket would be pretty much wasted on me. I don’t like beer and am not really a big drinker anyways and in fact SOMEONE would have to drive home. It was much cheaper and I got some cool straight edge X’s on my hands to show how badass I am. We met Sadrah, Mike, Seth, Rebecca, and Sage there and we all pretty much hung out for the afternoon. Josh, Sadrah, Mike, & Seth sampled the brews and Rebecca and I chased our toddlers around. Brewgrass was a great spot for toddling. It was flat since it was a baseball stadium or football stadium or some sort of sporting place and that made it great for the toddlers. Charlotte has only been walking for maybe a little over a month so it was great for her to just speed around mowing people down. Sage has been walking for quite awhile so she got her dance groove on. The two of them aren’t quite at the age where they are super interested in each other yet other than Sage kept wanting to hug Charlotte. It was the sweetest thing ever except Charlotte wasn’t having it. We joked that Sage was the typical southerner who was super friendly and wanted to hug everyone and Charlotte was the typical northerner and needed her personal space. The afternoon was pretty fun and I wasn’t even drinking. It got a little old that every five minutes someone would tell me my stumbling toddler was drunk but at the same time it was kind of expected. After several hours in the direct sun my toddling toddler started to slow way down and at the same time the music all of a sudden got a lot louder so Josh and I decided to take Charlotte back to the house where everyone would meet us later. She took another nap and awoke around the time when everyone else got back. We hung out at the house for the night and celebrated Mike’s birthday with cupcakes and cookies. We sat around and watched the little ones toddle around, Sage was still trying to get her cousin hug. When she realized she wasn’t going to get a hug from her cousin she climbed right up into my lap to snuggle with me which was all fine until Charlotte noticed SOMEONE ELSE was sitting on her mama’s lap. That didn’t end well. Eventually we all called it a night and went to bed. Friday morning we woke up early since we wanted to spend the whole day in the park and then be in a remote eastern part of it by 4 to see the elk rut. The hotel we were staying in had free continental breakfast so that was our plan. Most continental breakfasts I have been to usually have hash browns, sausage, eggs, maybe waffles, fruit, muffins, bagels, etc. I can usually cobble something together to at least get something in my stomach. I was not prepared for a southern continental breakfast which consisted of biscuits, gravy, sausage, eggs, and fruit in syrup. I deemed none of it to be edible so we left. We found a coffee shop and got some insanely expensive coffee and muffins and left Gatlinburg and headed back into Great Smoky Mountains National Park. We stopped at two different visitor’s centers to collect passport stamps, the Gatlinburg one and then one called Sugarlands visitor center. I don’t remember at which one but in one of them it took me literally 20 minutes to get the stamps for our passport books. Not because there was a line but because that is how long it took the lady to figure out whether the correct date was on the stamp or not, then change the date, and then stamp my book and the stamps ended up being upside down in the end. *sigh* Behind the Sugarlands visitor center were some walking/nature trails. It looks like a relatively flat and easy spot for toddling so we went and took a walk to a waterfall and let Charlotte toddle the whole way there. She is quite the mini celebrity when she’s out and about on her own. People kept stopping to watch her toddle around. We toddled to Cataract Falls which was quite pretty and we even saw a cool little salamander sunning himself on a rock. Afterwards we toddled back and then got back in the car. We stopped to talk to a ranger about our afternoon plans to make sure our directions were correct since our cell phones were completely useless inside the park. He gave us a suggestion for an easy hike with a baby so we set off to go back through the park the way we had come in yesterday. We were going to stop at Chimney Tops picnic area where there would be a good easy hike for us. When we got there however Charlotte was passed out asleep in her carseat and we didn’t want to disturb her. Instead we stopped and ate our leftover pizza then hit the road again. There is one main road that goes through the park called Newfound Gap Road and we were heading back out. We stopped at Newfound Gap (the overlook). Charlotte was still asleep so we took turns getting out and checking out the overlook. It’s a big huge parking lot and lots of people were there. Considering that I was disappointed in the view. It’s not a bad view by ANY means you still see the beautiful Smoky Mountains but you are looking from one side of the road across the road to the other side and it’s not quite the grand vista as many of the other smaller overlooks. There was a sign saying you were on the NC/TN line but other than that I couldn’t figure out what the big deal was. I have since learned it is the lowest gap along the spine of the mountains which allowed for the construction of the road through the park. I’ve also since learned it is where FDR presided over the dedication ceremony for the park in the 1930s and since the small road to Clingman’s Dome we had done the day before is closed most of the year it’s a good stopping point in the middle of the park for people to view the main ridge of the mountains. We crossed the line and went back into NC and drove onwards. We drove back out of the park with a brief stop at the Oconaluftee Visitor Center again for a bathroom break and to confirm the directions of where we were going since our phones were useless inside the park. Directly outside the park inside an Indian reservation called Cherokee we drove to a waterfall called Mingo Falls. We drove by it the first time around and had to double back to see the teeny tiny sign pointing to the parking lot. We got out of the car and put Charlotte on my back again. I couldn’t remember what I had read in regards to how long the hike was but I knew it wasn’t long. It wasn’t long at all but right at the end of the parking lot we were greeted with the sight of a giant staircase going up. There was 160 stairs we had to climb up then a very short hike to the falls. Once again I powered through and the view of the falls was worth it. It’s a very pretty view as you stand on a bridge overlooking the falls. After Mingo Falls we drove through the town/reservation of Cherokee. We didn’t stop anywhere as there was nothing there that made us want to stop. It was very touristy but also very rundown and a lot of what looked like they were once souvenir shops were now just empty. There was one giant casino we drove by and everything else was pretty rundown. Next up we stopped at a little turnout for Soco Falls. This time we had to hike DOWN a steep staircase then to an overlook. The overlook wasn’t super great but there was a very steep and slippery looking spot where you could hang on to some ropes to go down further for a better view. Since I had a baby strapped to my back we passed on the crazy rope climb. After both our waterfall stops we kept driving until we reached the Cataloochee area of Great Smoky Mountains National Park. Cataloochee is a remote valley in the park that has some old buildings that are examples of how people used to live in the Appalachians. Elk were reintroduced into the Cataloochee valley in 2001. To get there you had to drive this crazy windy narrow road through the mountains. It’s basically big enough for one car and eventually it turns into a gravel road. In our tiny Prius we wound around this road for what seemed like forever. I believe it’s about 10 miles until you get to the valley but since we had to drive so slow it took us awhile to get there. Once in the valley we were immediately rewarded with the site of a bunch of cars pulled over and people watching some elk across the field. The fall is elk rut season when bull elks amass a harem of lady elks. They make a crazy noise called bugling that sounds nothing like what you would expect an elk to sound with. Over in the field was a bull elk with a ginormous rack and two cow elk with him. We heard him bugle several times. I tried getting a video but was only mildly successful. After watching them for awhile we drove up the road a bit and in the field on the other side of the road was another bull with about 5-6 cows. More and more cars were coming and although I can’t say there was *a lot* of people since there was next to no room it was hard to navigate around. We traveled further up the road where it got even more crazy narrow. We were happy to have our tiny Prius. Even though we didn’t have the power of the pick ups and SUVs everyone else had we could navigate much easier than them. We went up the road a bit and pulled over and there were some cow elk RIGHT next to the road so I got out and stood by the car and got some photos. The road continued but we had already had such issues navigating around other cars we decided to just turn around and head out. We stopped by Palmer Chapel which was built in 1903. There was a big field in front of it so we let Charlotte toddle around for awhile and then we got back in the car and headed back out of the valley. A lot of people were now coming in since it was closer to dusk and it was fun navigating around them and the windy roads. We got out of the valley and hopped on the highway and headed back to Asheville. We met Sadrah back in Asheville for dinner and went to a Nepalese restaurant for dinner. It had a lot of Indian food on the menu and the Nepalese cuisine was very similar to Indian cuisine as well which confused me until I looked on a map to find Nepal nestled right on top of India on the map. Having a public school geography education (ie 1 class in seventh grade) I couldn’t remember exactly where in Asia Nepal was. Anywho the food was really good but Charlotte was not having the whole “let’s sit down at the table” thing and squirmed and freaked out through most of dinner. She would only sit with me and even then would not stay still. Normally she is really well behaved pretty much anywhere we take it so I could tell the long week and lots of overstimulation and tons of time in the car was getting to her. After we finished eating we walked up the street to the Friday night drum circle they have in Asheville. It’s *exactly* what it sounds like. It’s a bunch of crazy hippies in a square beating on drums and doing weird dances. We tried to get Charlotte to dance but mainly she just wanted to toddle around so we let her do that for a bit. Once we were done with the drum circle we walked back up the road a bit to a bar called the Thirsty Monk so Josh could sample some more local brews. We went to the downstairs area which was more open and there happened to be a ramp in the back and Charlotte spent the entire time we were there racing up and down the ramp. It apparently was good fun times for toddlers. Afterwards we went back to the Hop for more vegan ice cream. There are two different locations in Asheville for the Hop and we went to a different one than we had been to previously. I was disappointed with their variety of vegan ice creams. At the previous one I had gotten really yummy salted caramel ice cream. At this one apparently they thought that all vegans only like weird flavors. There was an avocado banana one which would have been ok if bananas weren’t disgusting. There was a matcha one i think which is a type of tea. There was a horchata one which at the time i was thinking was either a type of mushroom or pepper only later to be told it’s a Mexican hot chocolate drink which I had known and forgot. I should have asked because that actually sounds yummy. I ended up with the least offensive sounding one which was blueberry lavender which honestly still isn’t really something to get excited about in my book. After our ice cream we headed home for the night. For week 14 I was trying to get back on my normal track. 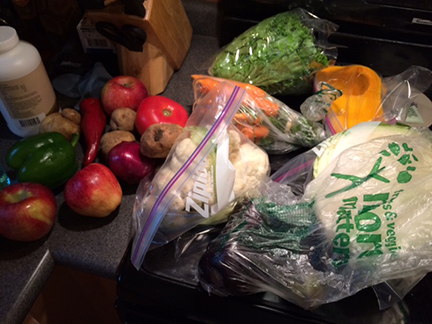 My dad picked up our veggies and sent me this pic. 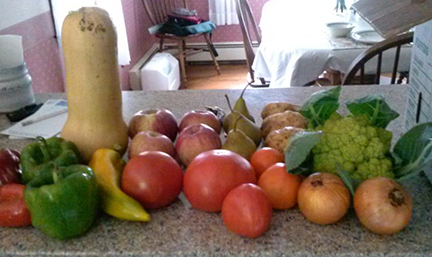 We got a giant butternut squash, lettuce, tomatoes, onions, apples, pears, potatoes, green peppers, red peppers, cauliflower. I also had him pick me up some broccoli and green beans while at the farm stand. Since it is finally fall I thought a nice chili would be good until the day I made it ended up being like 80 degrees out. Oh well. The chili used our CSA onions and a green and red pepper from the CSA. To go with it I made a broccoli/rice salad that used the broccoli from the farmstand. It also had lemongrass in it (from Whole Foods) yum! 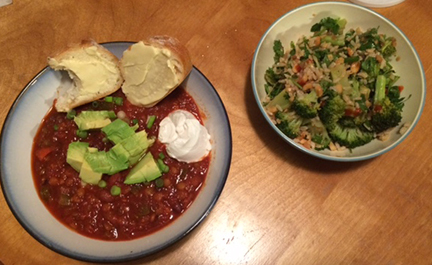 The salad recipe came from Salad Samurai and the chili recipe came from Isa Does It. 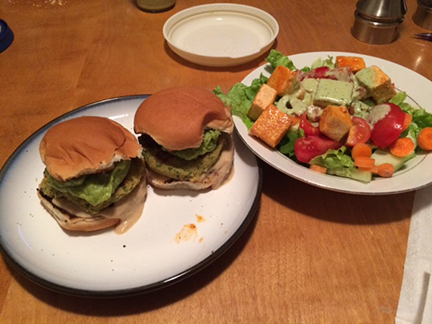 Next up I made one of our absolute favorites which is falafel sliders. The recipe comes from Chloe’s Kitchen. 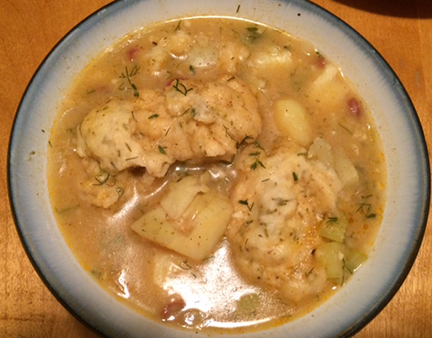 I used some of our CSA onion for it. 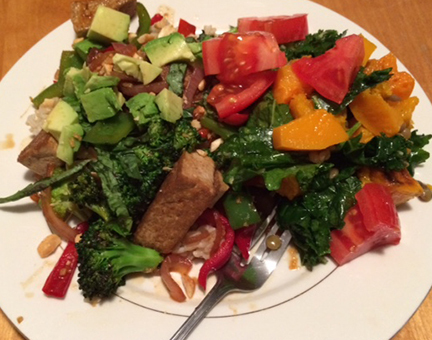 Then I made another new salad from Salad Samurai called Backyard Buffalo Tofu Ranch salad or something like that. I used lettuce and tomatoes from our CSA and the last cucumber from our sad garden this year.